After our first trip to Disneyland with toddlers, I realized how important it is to stay near the parks. Street blocks in Anaheim are HUGE. So if a hotel claims to be 2 blocks away from Disneyland, it may take you 30 minutes to walk there. When researching hotels near Disneyland, it’s important to find hotels across the street from Disneyland park entrances. You’ll find a lot of Disneyland Good Neighbor Hotels. I think the Anaheim Fairfield Inn, is one of the best hotels near Disneyland with toddlers. 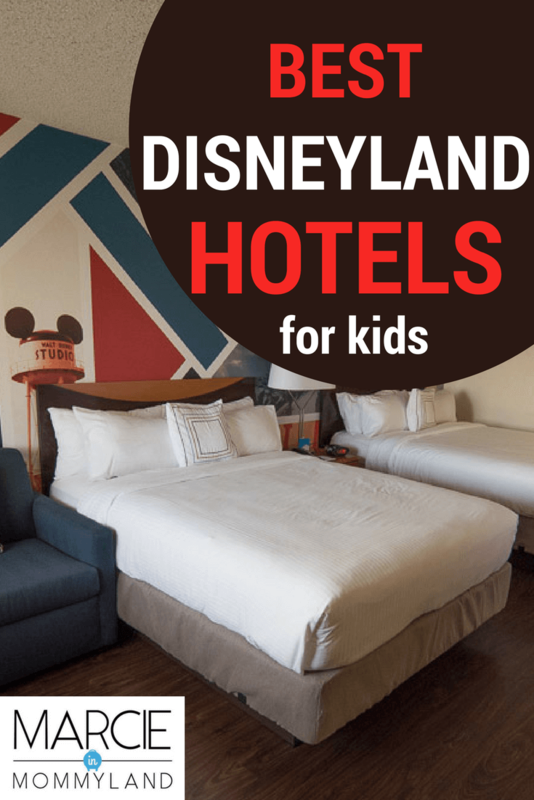 There are currently 41 Disneyland Good Neighbor Hotels and they are some of the best hotels near Disneyland. If you purchase directly from the Walt Disney Company, each guest gets a collectible Disneyland Resort theme park ticket. 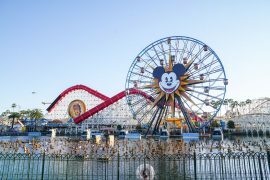 You also qualify for a Magic Morning early admission to Disneyland when you purchase a 3-Day Disneyland Resort theme park ticket or longer. As soon as we walked into the lobby of the Anaheim Fairfield Inn, we felt like we were already at Disneyland. It helps that the hotel is across the street from the entrances to the Disneyland Park and Disney California Adventure Park. There was a kiosk where families could purchase Disneyland tickets and a decent gift shop featuring Disneyland souvenirs and necessities, like hats and sunglasses. The lobby is quite spacious and also features a Kid’s Lobby, where children can watch the Disney channel. I can’t say enough nice things about the wonderful staff at the Anaheim Fairfield Inn. We arrived hours before check-in with two very different reservations. We asked for help sorting out our rooms and the front desk employee invited us to relax in the lobby while he worked on it. What felt like mere minutes later, he handed us keys to one of the rooms so we could change and head out to Disneyland Park. 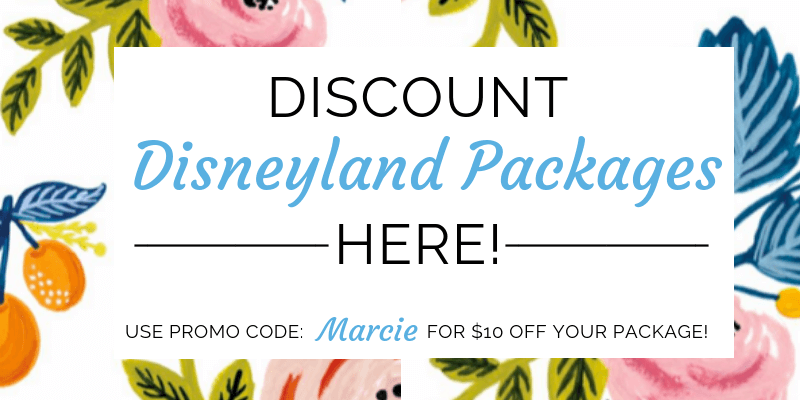 Click to read my Disneyland toddler tips and itinerary. 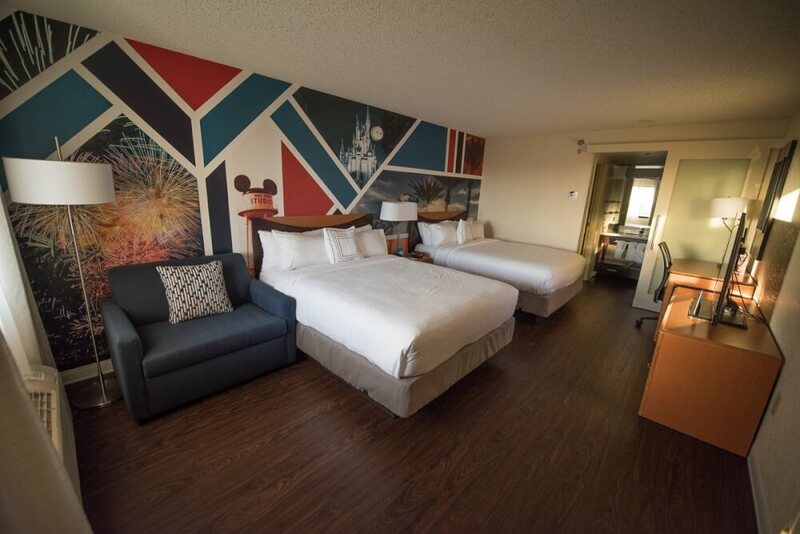 One of the reasons I chose the Anaheim Fairfield Inn for our Disneyland trip is that the rooms were recently renovated. Since this was our first time to this hotel, I’m not sure what they looked like before. However, I’m impressed with how they currently look. They are also a Disneyland Good Neighbor Hotel, so I was able to get our tickets with our hotel reservation. This is a perk of some of the best hotels near Disneyland. If you’re looking to stay on-site, read my review of Disney’s Paradise Pier Hotel. When planning a Disneyland vacation, the location of our hotel is the first thing I look at. 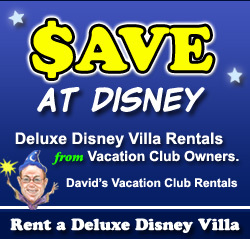 Many hotels say they are across the street from Disneyland or just a few blocks away. But, what you want to look for is where they are in relation to the ENTRANCE to the parks. The parks are huge and the blocks are much larger than typical blocks, so you may find yourself walking 20 or 30 minutes to get to the entrance when staying at these hotels. The Anaheim Fairfield Inn is across the street from the entrance to the parks. It took us an average of 7 minutes to walk from the lobby of our hotel to the entrance because we had a baby and a preschooler with us. As you walk away from the hotel, you turn left at the street and then cross the street at the light. Then, follow the crowd through the shuttle area to the security checks and into the entrance of your park. Also, there is a Panera in the parking lot of the Anaheim Fairfield Inn, so it’s convenient to get breakfast and coffee to go on the way to the park. We also grabbed lunch on the way back to the hotel in the afternoon to eat by the pool. It was an easy place to grab cold drinks no matter the time of day. Having these easy food options made it one of the best hotels near Disneyland. I absolutely love the colorful Disney art on the walls! The Disney vibe is modern and chic. I like that it’s not overboard and it elevates the whole ambiance of the room. It made me feel happy as soon as we walked in and I just wanted to flop down on a bed and relax with the kids. There was a small sofa that folded out to a bed. That’s where my 3-year-old slept. One of the most convenient features for families is the bathroom. There is a pocket door that separates the sink area from the rest of the room. 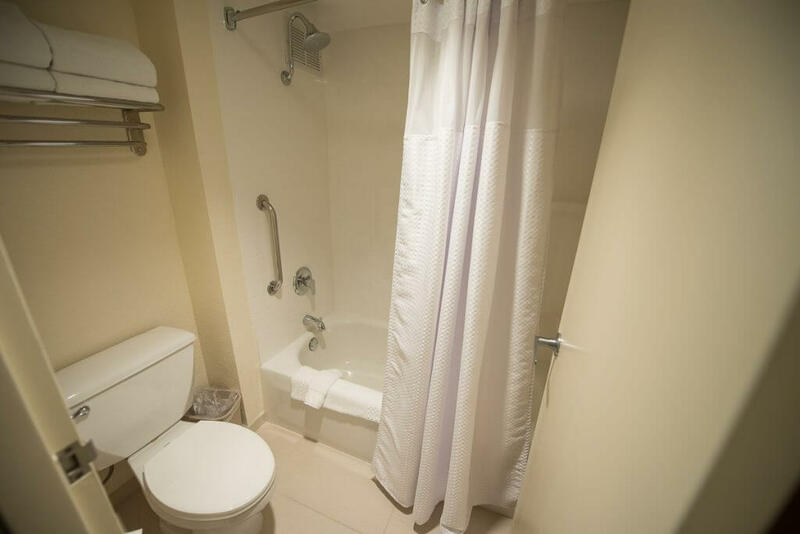 Plus, there’s an additional pocket door separating the toilet and shower from the rest of the bathroom. This means we could put the kids to bed and then take our showers and get ready for bed without disturbing them. This is also where the fridge is located. I think a fridge is vital for Disneyland with toddlers. We were able to keep little bottles of milk cold for my 3-year-old to drink in the morning. We ended up having all 5 of us in this Double Queen room. Since we were traveling with a baby and a preschooler and we were heading to a fancy wedding right after our Disney trip, we had a ton of extra luggage and two car seats and a stroller. With the extra bags and people, it definitely felt a bit cramped. But, I think we would have felt cramped in any room. Since we originally had reservations for two rooms, my Mom spent one night in the King Room with my son. There was plenty of room for the two of them and we even stashed the car seats in this room that night. The sofa in there was quite large and because of the little tables, it’d be easy to eat breakfast or take-out in the room. 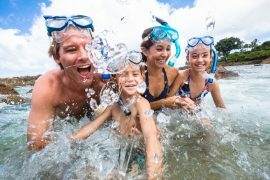 Some of these rooms can be connected, so that can be very helpful for large families or when traveling with a group. For a hotel room, I found this room to be larger than other hotel rooms. This room had just a touch of Disney art compared to the Double Queen Room. It was also located in a spot where they could hear the fireworks, but not see them. 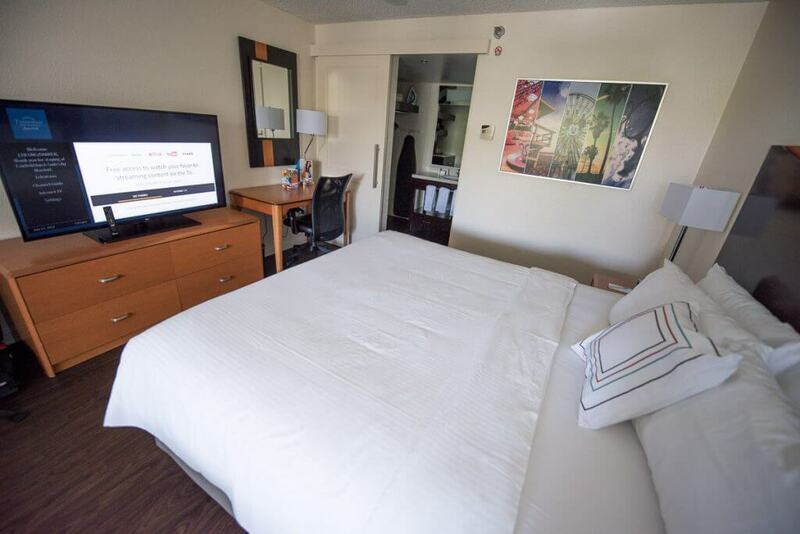 Like the Double Queen Room, the TV featured premium movie channels, HBO, CNN, ESPN, cable/satellite and we were able to connect to our Netflix account. The bathroom felt a bit smaller than the Double Queen Room, but would be ideal for two or three people. It also looked very clean and organized. Plus, the toilet and shower had a door, making it extra function-able for families. And the shower/bathtub combo is great for families with small children who take baths. 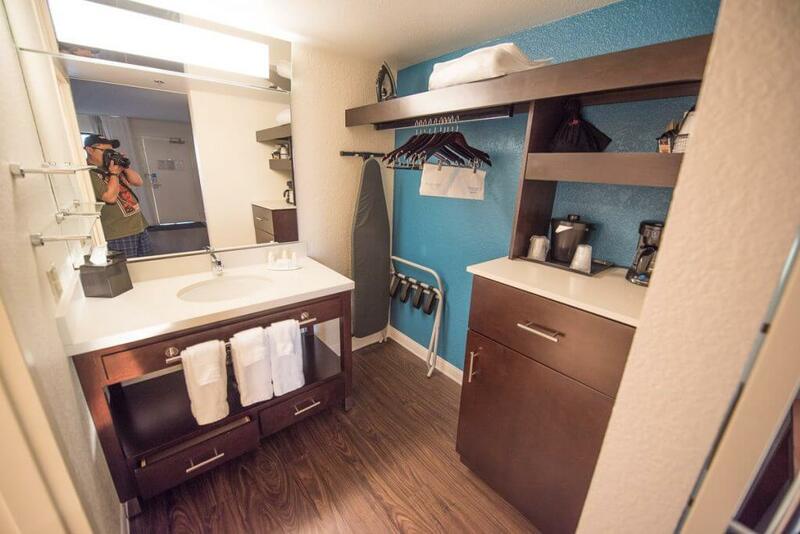 Bathtubs are hard to find, even at some of the best hotels near Disneyland. 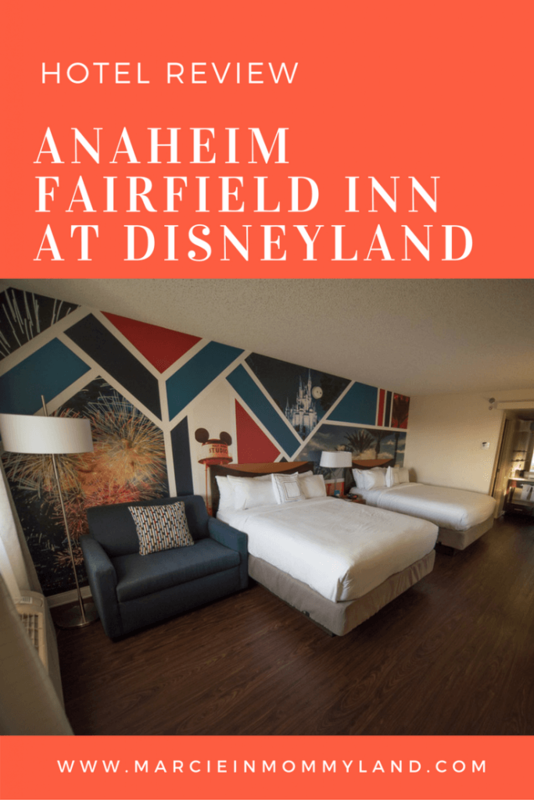 We will definitely consider the Anaheim Fairfield Inn for our next trip to Disneyland Resort. It’s one of the best hotels near Disneyland. The service was outstanding and the location was fantastic. Our rooms were bright and laid out well. Plus there was free wifi! The only real deterrent right now is that the pool doesn’t have the bells and whistles of nearby hotels. As my kids get older, this will be something to consider. If you go, try to get a room facing Disneyland Park. We saw tons of families camped out in the hallway ready to watch the fireworks from the comfort of the hotel. I also saw parents have their shades open so they could watch the show while their kids slept. Much better than fighting the crowds! 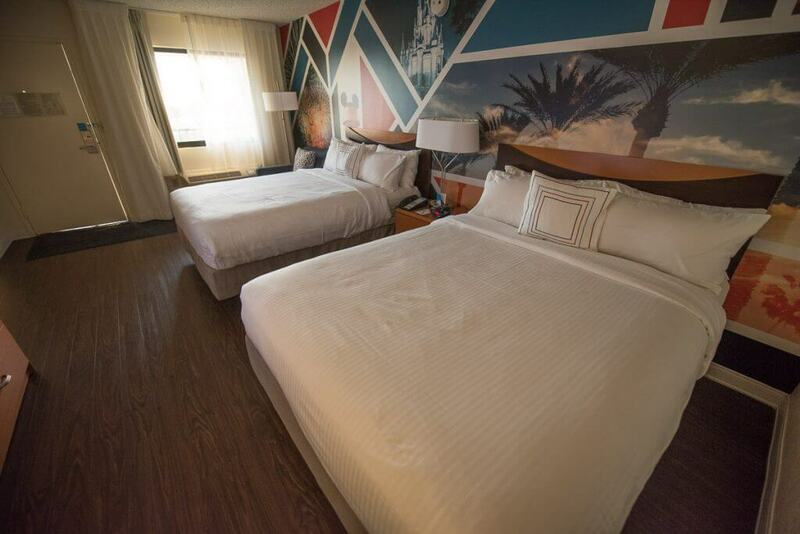 These hotel rooms look really clean and modern. I like the addition of a refrigerator. Never underestimate the convenience of a chiller, especially on hot summer days! Thanks for this recommendation! Thank you for sharing the review. Will keep it in mind if I travel that side of the world or use the chain of this hotel. It’s perfect if you’re visiting Disneyland! This room looks so nice! I can’ wait until I have my kids and take them to Disneyworld. I hope I remember this review by then. It’s right across the street from Disneyland so it’s great for families! That pocket door that closes off the vanity area is so important! I get up two hours before everyone else (even on Disneyland trips!) and everyone else needs their sleep for long days at the Parks! Very helpful review, thanks! Exactly! I like that they are a bit quieter than traditional doors, too! We love Disneyland, and while we have always opted to stay on site, we will certainly consider your recommendation next time in hopes of saving a few bucks. This was our first time staying off-site and I was relieved to still have the Disney vibe there! 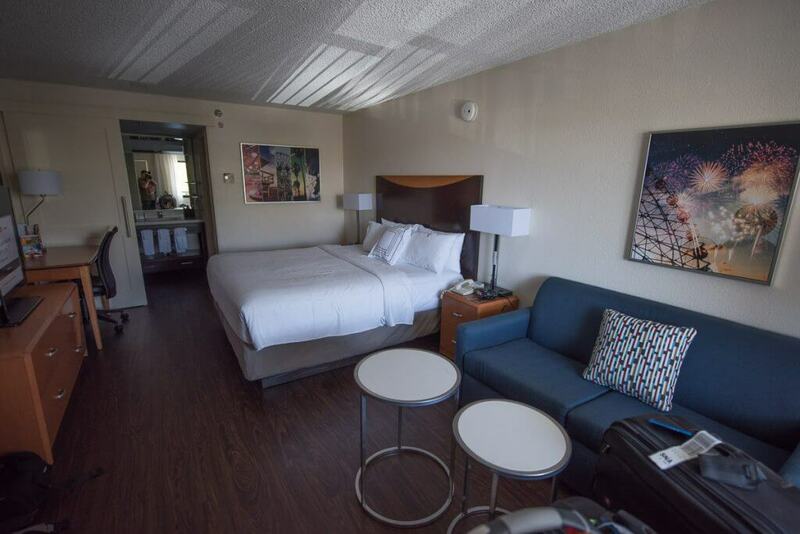 The Anaheim Fairfield Inn looks a good choice, especially for travelling families like yours! It seems pretty spacious, but did you find it totally adequate for your needs? That’s a good tip for other families, to ask for a room overlooking Disneyland! Thanks for sharing. Yep, it fit all our needs. Had we not had both our huge car seats in the room, it would have been very comfortable. 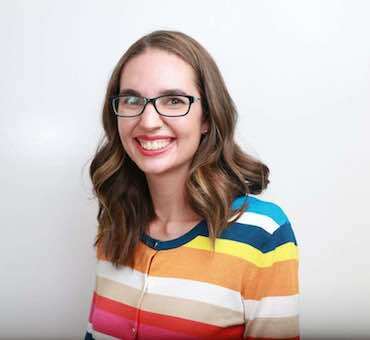 This hotel really looks like it is well set up to cater for families with young children (not surprising when you consider 99% of its business would be visitors to Disneyland!). The renovated rooms certainly do look good and fresh. This place would be one to bear in mind when visiting the park and it’s good to hear you would stay there again. Yes it’s a great hotel facelift! And perfect for families with little kids! This looks like a great option for Disneyland. The location seems ideal and the fact that the service is excellent is enough for me! Time to plan a Disney trip now! Thanks for sharing I am going to disneyland and will keep this place in mind. This looks like a great hotel! The rooms look spacious at least for a big city! This looks like an awesome hotel and a great value! I haven’t visited Disneyland but I’m dying to. This hotel looks really stylish instead of most of the more themed ones with bright colors and toys. 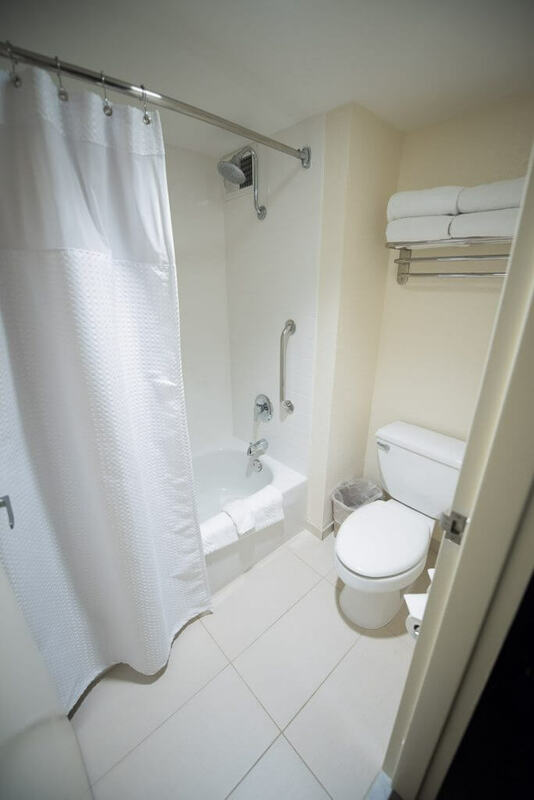 The bathroom is even bigger than the beds, wow. It must be so nice to come home after a fun day at the park and relax here. Yes, I appreciated the modern twist with the Disney element! This looks amazing! I’d love to bring my littles to Disneyland!!! Thanks for sharing! The Fairfield Inn seems like the perfect place to stay when visiting Disneyland! I love the modern furniture and the Disney decorations. And how awesome is that bathroom?? 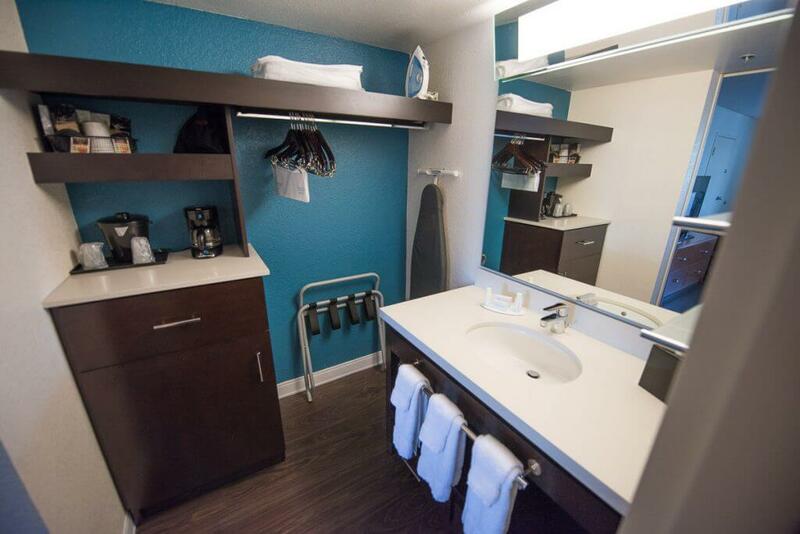 I’ve never seen a hotel set up like that, with the refrigerator/coffee machine inside the same location as the sink. That’s genius! I know! Such a great idea because parents can really get 100% ready (including coffee) in the bathroom without waking kids. This hotel looks like a great option for staying at Disney! The room is so spacious and the layout is great! Free wifi is also definitely a plus! 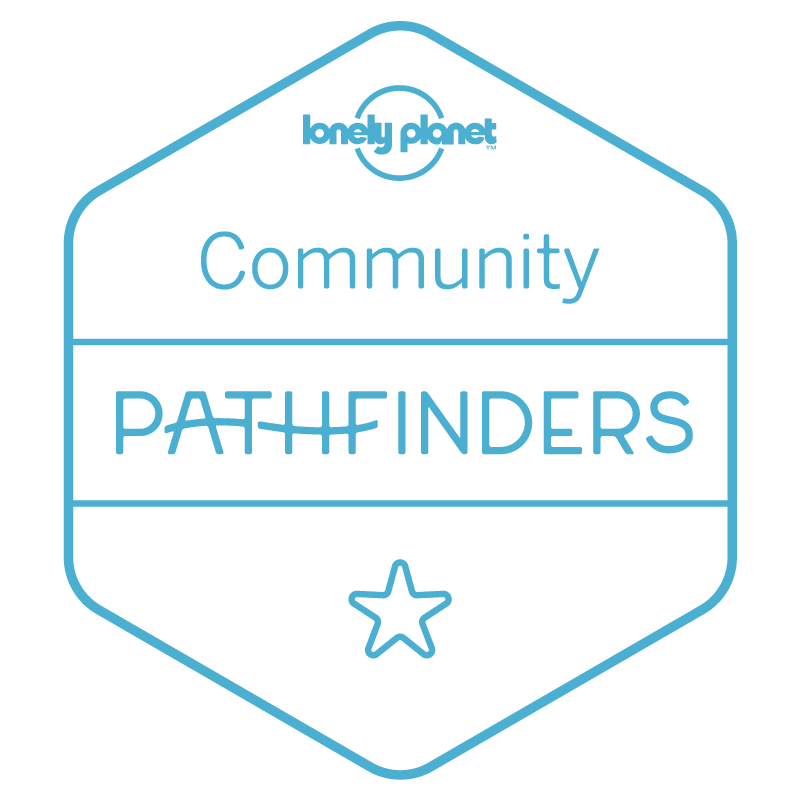 Thanks for sharing, will book mark this for our next trip! It was a really nice hotel! I was actually surprised how much I liked it! How was the hotel parking? I’m not sure because we only rented a car on the day we checked out and they let us stay in front of the hotel to load up. But, I saw parking attendants so I know parking was available somewhere.